The ‘Tru Plant’ Witches recorded a 48-42 victory in their final warm-up fixture against Leicester on Thursday night at Foxhall. It was the home side’s first meeting on home shale in 2019 and although they held the lead throughout the meeting, their Championship opponents kept things tight with just six points between the teams going into heat 14 before the Witches hit a maximum to seal the win. Captain Danny King top scored on the night with 10 points. David Bellego began life at Foxhall in fine style with a race win in heat one ahead of Scott Nicholls with Chris Harris third for an early heat advantage to the home side. Ipswich asset Drew Kemp, deputising for Krystian Pieszczek, won heat two as visiting reserve Connor Mountain kept Jake Allen behind him for second, meaning another 4-2 to the hosts. Cameron Heeps, who had overcome a wrist injury to be fit for the meeting, won heat three as the points were shared for the first time on the night, leaving the Witches 11-7 up. King won heat four for the Witches with Richie Worrall second and Kemp took third as the Witches edged further ahead. In came Lions number eight and former Witch Rory Schlein for his first ride of the night in heat five as he replaced Ellis Perks. However, having made the start, the Australian fell on the second turn and was excluded from the re-run as he received treatment from the medical team. After a delay to the meeting whilst Schlein was treated, it was confirmed that he would withdraw from the meeting as a result of the crash. Lone lion Nicholls won the re-run to prevent the home side from extending their lead. Harris made the start in heat six but was passed by Worrall on the third turn of the opening lap. The Witches number one came back at Worrall to pass him on the following lap to take the win and with Bellego third it put the Witches 22-14 up. King was in a class of his own early on and won heat seven, but Allen couldn’t get amongst the points for the home side. Bellego was a winner again in heat eight but it was the drama behind him that caught the eye. The Witches looked set for a 5-1 but Mountain managed to pass Kemp on the final turn to limit the home side to a 4-2. 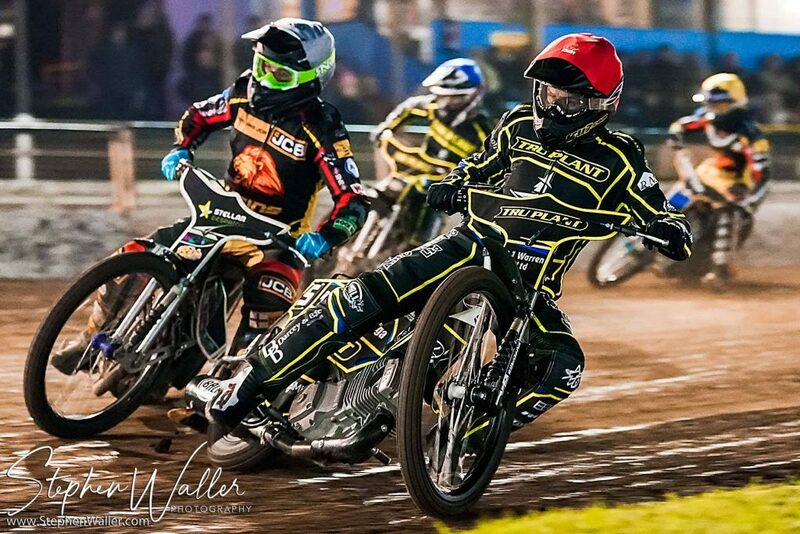 The visitors brought in Nicholls as a tactical substitute in heat nine and it paid off as he tucked in behind Worrall for a Lions 5-1 that put them back in the meeting with the Witches leading 30-24. The away side were coming on strongly and Josh Bates won heat 10 ahead of Harris with Ryan Douglas picking up a point for a 4-2 to the Lions. There was a fantastic battle in heat 11 as King and Nicholls traded moves at the front but it was the Witches skipper that came out on top for the win with Allen taking third for a Witches heat advantage. Richard Lawson got his first race win of the night in heat 12 beating Bates with Kemp third for a 4-2 to put the hosts 40-32 up with three to race. Nicholls won heat 13 for the away side as Harris passed Worrall for second on the second lap. That Lions heat advantage kept their slim hopes of a result alive with two heats to race. Those hopes disappeared in heat 14 though as the home duo of Heeps and Allen raced to a 5-1 to seal the win with a race to go. The away side ended the night on a high though as Nicholls and Worrall teamed up for a 5-1 to make the final score 48-42 to the Witches. Captain King top scored for the Witches and it was great to see him back at Foxhall and winning races after his injury nightmare of 2018. The skipper was back to his best in his opening three rides, reeling off three race wins including a great pass on Nicholls to win heat 11. It always looked like the Witches would record a victory, but the away side wouldn’t let the hosts out of their sight. It took until heat 14 to confirm the win as Heeps and Allen teamed up to record a 5-1. Once again this was just a challenge fixture so there were no points at stake. The win means it’s two wins from two for the Witches from their warm-up fixtures and they can take some confidence into their first competitive meeting of the season next week. The ‘Tru Plant’ Witches host King’s Lynn on Thursday 4th April at Foxhall Stadium in a Supporters Cup clash.